Jayne and Trevor offer consultancy support, training and the delivery of improvement and development programmes for local government, the NHS, community and voluntary organisations. They can also run community engagement and development activities working for, alongside or within your organisation. They are particularly interested in organisational change, community development and the 'co-production' of outcomes. Their approach is often to look at the 'whole system' rather than individual services, issues or problems. They work with a number of Associates, each a recognised expert in their own field, and can tailor an individual solution to the challenges that your organisation is facing. As an elected representative, the duty of a Councillor is to make decisions on behalf of their ward and the citizens who live in it. Councillors are able to provide this political leadership by setting and influencing the policy priorities affecting their area through the different decision-making structures of the council, other local service providers and community organisations. • be aware of the implications of current policy developments and local issues including opportunities and challenges. Do you have the assets and strengths to see it through? Do you understand the others agenda? How are you going to handle resistance and inertia? We will help you to focus on outcomes and enabling others in co-producing ways of achieving them. Peer leadership is often effective in partnerships - leaders in partnerships are not necessarily the 'bosses'. The source of authority in partnerships will often shift from a reliance on positional power to an emphasis on knowledge, understanding and personal trust. The principles of ABCD are that it is asset-based, place-based, relationship-based, citizen-led and it promotes social justice and equality. ABCD is a process of community building that starts with the process of locating the assets, skills and capacities of residents, citizens, associations and local institutions. Mapping the assets in a community; building relationships and connections to change values and attitudes; mobilising people to become self-organising and active; convene a core group to identify the key theme or issue that will inspire people; lever in outside resources but only to do things that communities cannot do themselves. Participants make a map or inventory of the resources, skills and talents of individuals, associations and organisations. They discover and collate the links between the different parts of the community and the agencies. Creating a map or an inventory is more than just gathering data and information. It is a development and empowerment tool. The process of discovering the hidden and potential assets in a community creates new relationships and new possibilities. In Appreciative Inquiry (AI) we learn from successes; look for what works well and do more of it. AI is a process for valuing and drawing out the strengths and successes in the history of a group, a community or an organisation. These are used to develop a realistic and realisable vision for the future and a commitment to take sustainable action. It is not an uncritical or naive approach; it creates a positive mindset by talking about success rather than being defined by past failures. Define - the key stakeholders agree the positive focus of the inquiry. Design - what would they have to do to create the ideal vision of the future? Whoever comes are the right people. Whatever happens is the only thing that could happen. Whenever it starts is the right time. When it's over, it's over. Open Space Technology is a way of organising a meeting or an event that allows a diverse group of participants to work on a complex and real issue. The process works best if representatives from the 'whole system' are in the same room. In a session there are no presentations, no set agenda and only loose timings. The convenors set up a central and open-ended question or statement that the participants are passionate about. This provides the framework for the event. The learning from the session will answer the initial question as well as commit people to action. The World Cafe is built on the assumption that people already have the wisdom and creativity to confront even the most difficult of challenges. It is a way to engage large numbers of people in a conversation on an issue that matters to all of them. It is especially useful way for communities, Councillors and service providers to talk to each other productively; share their knowledge and collaborate on ideas for change. In the Cafe people sit round tables and talk to each other with one person acting as the host. After about 20 minutes they move on and the host stays to tell the new people about the previous discussions. At the end the emerging themes and ideas are collected and distilled by the whole group. Organisational change works best when we shift from focusing on problems that are rooted in the past to looking at the future and its potential. A series of methods that are used when an organisation or community wants to create a plan for moving into the future that they prefer rather than simply responding to what happens. Health Impact Assessment (HIA) makes explicit the health impacts of changes and developments so that the health of communities is not damaged. HIA is a structured process for examining the potential effects, both positive and negative, of new or altered developments, services or policies. HIAs can be prospective to highlight the potential for benefit or harm; concurrent to ensure that health remains a priority; or retrospective to evaluate any impact. People who are aware of the many factors that influence health are empowered to improve their own health and the health of those they connect with. Understanding Health Improvement is a Level 2 Certificate awarded by The Royal Society of Public Health (RSPH). The course is delivered over one day and covers both the social and individual factors that influence health. 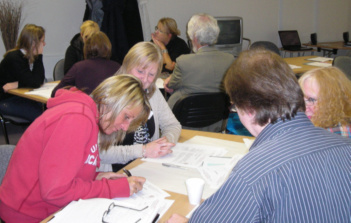 The course is aimed at front-line employees in the NHS, local authorities and the community and voluntary sector. The course is an important element in building capacity for health and 'Making Every Contact a Health Improving Contact'. Every contact, activity and decision we make can improve the health of individuals, families and communities. Capacity building for health uses a 'social determinants of health' framework to engage all services and staff that contribute to creating healthier people and communities through their 'core business'.